It's hard to think of the start of any new franchise that has had much hype levied upon its shoulders as Destiny. But even before its Alpha and Beta test phases it was already on track to be "the biggest game of the year" and the potential flag bearer for the next-generation of gaming. And thankfully, you'll be pleased to hear, those shoulders are big strong enough - Destiny is able to carry the Bungie development name and half-a-billion dollars of overall spend on one side, and the weight of expectation of the entire gaming community on the other. Destiny is a new style of game, one we fully expect to see emulated and expanded upon over the coming years, and it is leading the charge for always-online gaming as we enter an era of higher broadband speeds and enormous processing power. It's an odd era to get used to for a reviewer. Before we could even start playing the final build of the game, the UK servers had to be switched on. And that only happened at around midday before Destiny was released worldwide. So the quandary was, do we rush review a game we've played for a few hours - but many, many more in the earlier Alpha and Beta versions - on the expectation of things being as good as, if not better, than the Beta as the full version progresses? Or do we wait until we've played long past the sections already covered in the public testing phase in order to give a far more accurate judgement? We chose the latter. But even so, and being brutally honest here, while we feel we've now played enough to give a valid opinion of what Destiny is like and why we like it so much, we still feel as if there is more to come. We've not finished the game, nor do we feel we will for quite some time, but we have played a large swathe of levels, levelled up our character sufficiently and got to grips with all manner of interesting weaponry. We've also been shot about a billion times in the face by Crucible players that are way better than us, but that's another story. The main game, for us at least, focuses on the campaign and it is perhaps here that the next generation of gaming has begun. 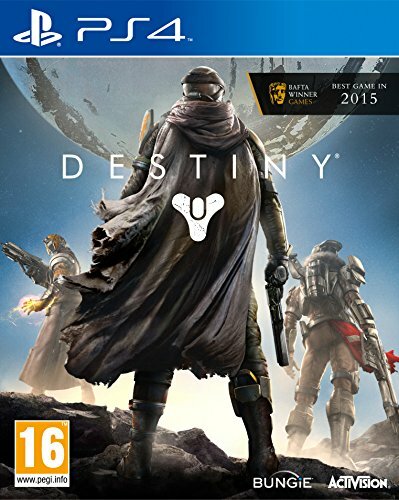 Because of the always-online gaming world and mission structure, you can either take on each story-fuelled section on your own, with just your Peter Dinklage-voiced Ghost robot assistant as your companion, or you can assemble or join a Fire Team - a collection of three like-minded Guardians who, generally speaking, make everything that little bit more simple. And more fun. If you can't find any real-world friends to help, that's fine. You can always approach a character in the game world and suggest teaming up. Plus, as we've found quite often, even while playing a mission solo, you might find someone else doing the same - and while they aren't strictly part of your Fire Team, they help dispatch waves of foes, at least before the non-spawning areas begin. Most of Destiny's open gameworld, which is split into large, sprawling locations accessible by spacecraft, has pockets of Fallen or Hive nasties that pop-up in pre-designated areas. And while they don't necessarily form part of a mission per se, they can get in the way. It is here that you'll be pleased with any help as you'll soon enough see them as little more than a barrier. The main mission objectives happen behind darkness areas where things get a bit tougher. Should you die in these scenarios you won't immediately respawn (come back to life) in the same place where you met your demise. It's then that you'll often wish you'd brought a real friend or two along. Not only can they help tactically and bring increased firepower, but when you fall in battle, they have a brief window where they can revive you. And vice versa. Bungie has really come into its own on the collaborative gameplay elements in Destiny. We've never played a game so geared around community aid and enjoyed it as much. There are also Strike missions that are set apart from the main storyline where you can be paired with random strangers automatically instead of just friends, and playing the first of those showed us another side of Destiny that impressed. Having entered a Strike mission with two complete strangers, we instinctively worked together and formed strategies without even needing to say a word to each other. Not once. There are few co-op games that can afford that kind of instant comradery. Either that or we were as equally useless as each other and blundered our way through the level with fortune rather than skill on our side. That's not to say that we haven't had online chats with fellow players while taking out enemies with single shots to the head. In our case, we spoke clearly through a PlayStation Camera attached to a PS4 - the copy we tested, although we have also played the game on Xbox One (it's also available on PS3 and Xbox 360) - and it worked well; we were audible and clear. It did help us achieve our goals in patrol missions that bit more quickly. As for the gameplay mechanics themselves, Bungie has been very clever in adding role-playing elements to the proceedings. It's no Mass Effect - mainly because the story is more conceptual and overarching rather than definitive and driven - but the character development system is a work of genius. Not only does it help draw attention away from the fact that the basic gameplay in Destiny owes much to Halo, unsurprisingly, but it encourages replay and customisation. Within a few short hours of playing the final release (you can't port your Beta characters over so must start again) our fourth level Warlock character was markedly different to the one played by a friend. We had different weapons and clothing (armour), so looked different and could perform a slightly different role in the Fire Team. And now we've beefed and levelled up far more, the tree of possibility has many more branches and we're barely recognisable from each other, even though we started in the same character class. This is what makes Destiny stand head and shoulders above many of its peers for us. While being a science fiction-based first-person shooter in the mould of others before it - Halo, most obviously - it layers on different ideas and elements from other corners of the gaming spectrum. And does so with such panache and skill that you wonder why the marriage has never worked so beautifully before. We have rarely played an first-person shooter that has drawn us back so often, even to play the same low-level missions over and over again. On the next-generation consoles Destiny is a wonder to behold visually too, with a beautiful palette - not least in the non-mission-centric role-playing hub that is the Tower - and you never even realise that it's not running in 60 frames per second. While that might be disappointing for some, we feel that it gives Destiny a more film-like look, something that sits well with its Hollywood-style scope. It can't be stressed enough how much we like Destiny. Naysayers will naturally claim that we've been bamboozled by the hype. Certainly there are some parts that aren't as good as others - the repetition in enemies, their spawn points and strategies, for example. But they are minor distractions from what is a fantastic technical achievement. Bungie has created something new without foregoing what has worked in the past. It has weaved different gaming genres together to bring an industry churning through untold sequels of first-person shooters kicking and screaming into a new age. It has replaced the idea of barely interactive spectacular set pieces with gameplay that you are very much a part of. Unlike titles such as Titanfall and the forthcoming Evolve - both worthy games in their own right, but seemingly hamstrung in comparison - Destiny asks rather than demands that you to bring friends and comrades along for the ride. Destiny is beautiful, bombastic and quite simply brilliant. It's every bit the title we've been waiting for to kick start the next generation. Let the games begin.